Serene Lee is non other than our National Road Champ, who is also part of the Maaslandster International Women’s Cycling Team in Europe. She is currently pursuing her pHD in Murdoch University, Australia, and rides for the Dome Coffees Cycling Team. She’s a force to be reckoned with. She also shows us that with hard work and resilience, #thisgirlcan achieve anything. You go girl! Ling Er is a prime example of “whatever brings you down will eventually make you stronger.” She came back strong from her near fatal road accident in 2009 almost ended her Ironman career. Back in July 2018, she was crowned as the National Individual Time Trial Champion in the women’s category. Her average speed of 40.7km/h in the 32.8km course will put many guys to shame. This guy is a legend. Period. Similar to the Red Hook Criterium in America, Zul created the Holycrit. 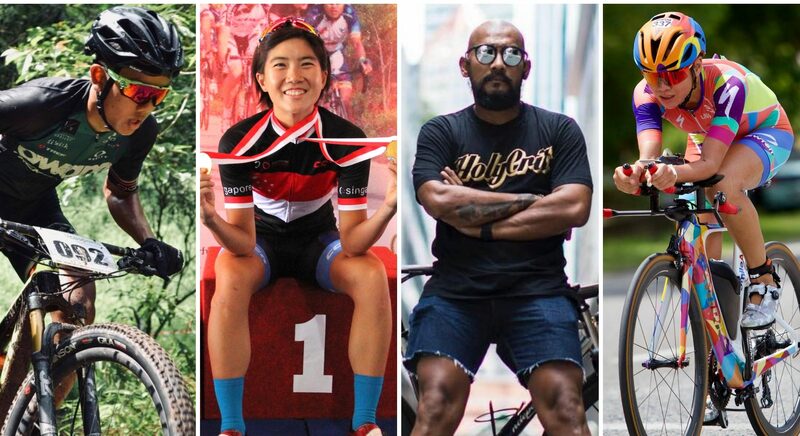 The idea of this race was initially born for the fixed gear community, but he has reached out to all cyclists from different disciplines in the recent Holycrit that was held at the Karting Arena. Regardless of what discipline you are in, be it fixed gear, mountain bike, or road bike, everyone had the opportunity to come together for some heart pumping action on two wheels. He’s all about bringing the cycling community together. His posts are always tagged with the hashtag #bronotpro, but #yousurenotpro bro? Hot mom alert!! Claire is a great example to other mothers out there, that having a little baby does not mean that you cannot find time to stay active. Claire and her husband are owners of the Karting Arena, which recently hosted the Holycrit cycling event in their winding course. At only 20 years old, Riyadh has proven to be unbeatable as he was crowned triple Singapore champ in the road, mountain bike and downhill races in the Men’s U23 category. He’s definitely one of Singapore’s young and rising stars. Together with Christine, they started a mountain bike coaching company called floowmtb. Look no further if you are trying to hone your mountain bike skills by these patient and experienced ladies! Be ready to laugh your socks off with Irsyad’s sense of humour. Definitely follow him on instagram if you need a little “perk me up” or a mood booster, like this short clip here on “the 3 things i like about you”. Who else do you think should be on the list?